Whether they are called "fluid", "friction", "knee" or "lever-action", they are all a 'rotary shock absorbers' with fluid braking for motion resistance. Houdaille was actually a brand name, and they supplied shocks to Ford, Plymouth, & Studebaker to name a few. Delco made a piston version for GM, but those weren't round shaped. Cutting-edge in it's day, rotary shocks were a fixture on millions foreign & domestic autos from the 1920s up until the late 40s. But by 1950, less expensive & easier to produce "Aircraft Shocks"(because WWII solders saw them on planes first), known today by many as the modern tube shock, made their way into all cars produced in the USA. But the tube shock lacked one convenience Houdaille shocks had --adjustability. The amount of dampening was easily adjusted by turning a little pointer with pliers. Soft for rough roads, stiffen for city driving, and varying degrees in between. 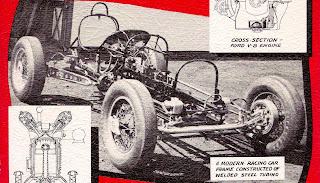 That options was on Houdaille made shocks for Ford from the mid 30s to the end in 1948. And that adjustability is why they were continuing to be used in racing applications through the 1950's. I've chosen to use rotary shocks on my T race car because if my car were to be built in 1950, those shock would have been abundant at any wrecking yard, probably for a dollar or less. Today, they are still quite inexpensive and although not very easy to find, many good ones are out there. I was lucky to find exactly what I needed on ebay again. Patiently waited for matching pairs of fronts and a pair of rears. I made sure they weren't frozen solid, otherwise they could be entirely useless. Shocks are either for the right or left side of the car, as indicated by the filler plug position. 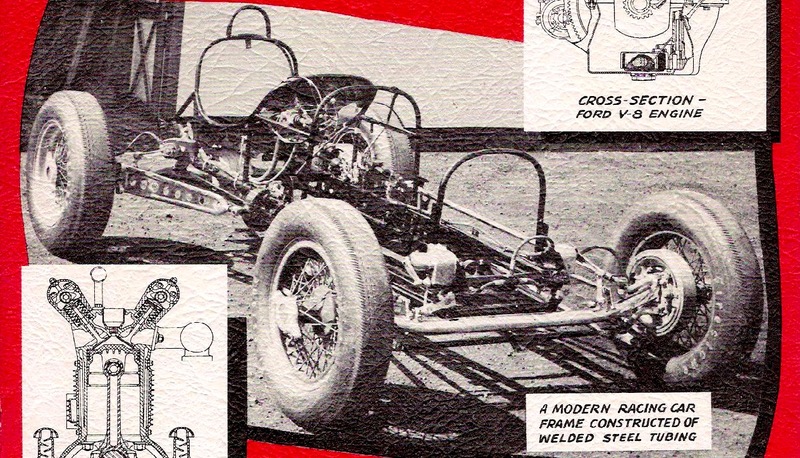 The Studebaker used different linkage then the Fords do, with replaceable bushings top & bottom. Here are all the parts I needed to set up the shocks. The NOS 1947-49 Wohlert brand OEM links are for the Studebakers. Dog-bone style for the Fords, this is a 4" example. And I already had a set of original Model A shocks mounting bolts. Putting the shocks right on the frame, like factory, wasn't working --the suspension is too low. Ford shock links only come 3" or 4" in length, not 1". The solution was simply move the shock up about 2" with a bracket. Tracing the outline onto cardboard is the simplest way to make a template. 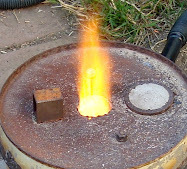 Raising the shock also cleared the brake hose on this application. The rear shocks were a little more complicated. I had to go a little out-of-the-box for this set-up. The reason I went with this type shock & location was partly due to the frame kick-up being so far forward of the axle, and other reasons. But I think it will look pretty cool. It's definitely race car builders would have done back then. I'll use some of my scrap parts to attach the low end of the link --like this rear radius arm severed front end. Now that I've designed the braketry, it's just a matter of transferring it onto 3/8" steel plate. I used my trusty oxy cutting torch to make quick work of it thick plate. That's the template for the rear shocks bracket. So what followed the cutting was bench grinder time to clean up the edges, also hand files were used to fine-tune them. I'll cut these front axle shock-eye off a 1939 Ford perch-pin, I happen to have in my yard. It will need sanding & shaping before I weld it on to my vintage spring perch (which I previously shaved). Here is the front shock bolted onto the newly welded and primed bracket. Looks good to me. Similar to things I've seen on actual Sprint cars. This 4" shock link is actually kind of too long. Besides, it's totally shot anyway, I was only using it for set-up. Back over to the rear again. This is the freshly welded on bracket. Now primed, I bolted on the shock. Works just as planned. Sure using tube shock might have been simpler, but the look of these rotary shocks will excite a lot of vintage car enthusiasts. Some might even think it's an actual old racer. I'm using Armstrong lever shocks on the front of our '29. I'm convinced they work better than a tube shock that has to operate at an angle: smoother, more supple ride. I've actually read that lever shocks are a better match with buggy-spring type suspensions like on a Model A then with tube shocks. I'm In Rod & Custom Magazine!